Huge department stores were once the commercial centers of just about every city. And one big part of the department store experience of old was the elegant restaurants they had. Ever hear the phrase “ladies who lunch”? Well, way back when, these ladies often lunched at their local department store. And folks would actually get dressed to the nines to dine in the “tea rooms” housed in these retail behemoths, most of which don’t exist anymore (or became Macy’s): In Atlanta, Rich’s had The Magnolia Room. In Chicago, Marshall Field’s had The Walnut Room. Out west, shoppers at Bullock’s dined in the Desert Tea room. Two department store chains that have continued the tradition of having in-store restaurants into 2015 are Nordstrom and Neiman Marcus. Both stores actually operate multiple dining concepts across their stores nationwide, including their respective locations right here in Atlanta. 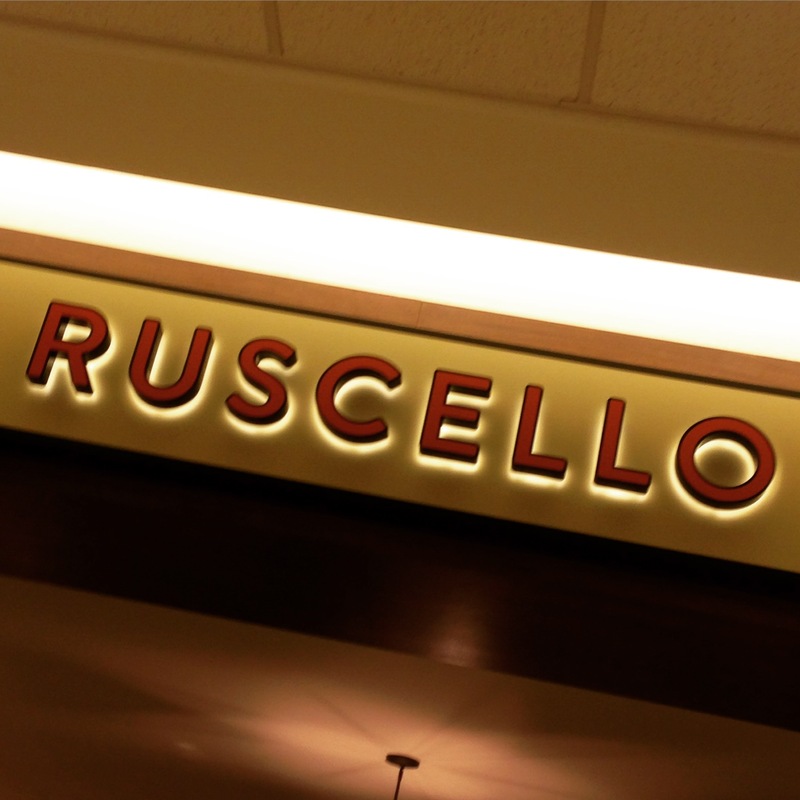 Well, this past fall, Nordstrom unveiled one of their many in-store dining concepts, Ruscello, at it’s store at Perimeter Mall. While not exactly as high-brow as the tea rooms of department stores past, there is a vibe of “casual elegance”. Unlike Marketplace Café, which was the cafeteria-esque concept that existed at this store previously, Ruscello is, according to Nordstrom’s website, “a full-service restaurant featuring Mediterranean and Italian-inspired cuisine. The menu is bold in flavor, focusing on great appetizers, salads, sandwiches, brick-oven pizzas, pastas, entrées and housemade desserts.” In case you’re thirsty for something with a little “kick” to it, there’s also a full bar, supplanting beer-and-wine-only from the previous concept. The decor is an improvement over what was here before. Not that was here before was so bad, but it was clearly something out of 1997, which is when this Nordstrom store and its original restaurant opened. The new look is a lot cleaner and more contemporary. However, in my opinion, Nordstrom could stand to invest in a couple of pieces of art to liven up some rather prominent blank walls. Other than that, it’s a pretty nice, laid back atmosphere. I you’re a regular Nordstrom shopper, you’re probably familiar with their legendary customer service. Well, it doesn’t stop on the sales floor. We were treated very well. Our server was very attentive and friendly. 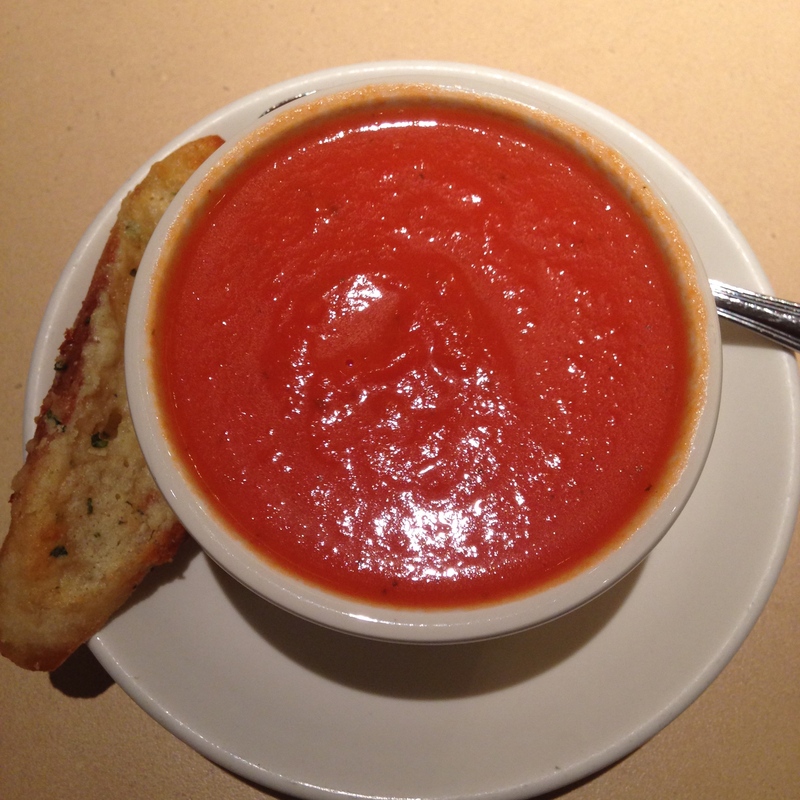 Always served piping hot with a slice of garlic cheese crostini, this soup is a must have! This is nothing like that stuff out of a can. This is hearty, has a noticeable yet smooth texture, and a great tangy flavor. For my entree, I decided to stray from my usual aforementioned salad or panini and order a Pizza de Parma, which was also quite tasty. The crust’s thickness was just right: not too thick and not too thin. I just wish it was a little bit crispier on the bottom, but at the same time, it was more than adequate. 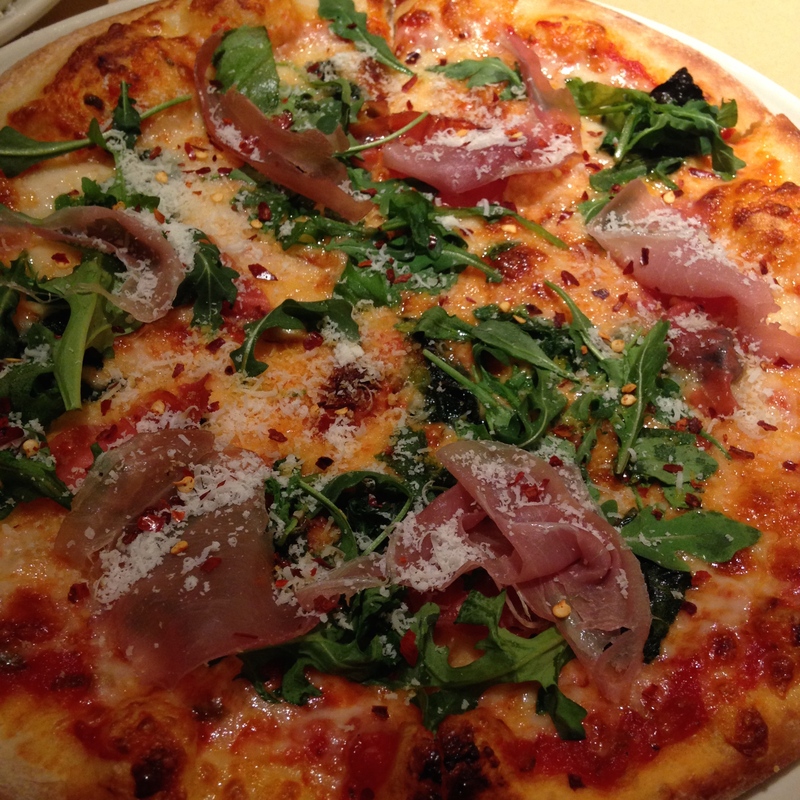 The pizza was topped with prosciutto, arugula, spinach, provolone, and parmesan cheeses. This made for a unique combination with great depth of flavor, especially from the smoky prosciutto, peppery arugula and the savory baked parmesan. One disappointment I’d like to express is that Ruscello don’t carry the Royale Cookies which was served during the Marketplace Cafe era. These delights loaded with chocolate chips, macadamia nuts and coconut were a true crowd pleaser. Nordstrom, I think I speak for all of your Atlanta shoppers when I say, “we miss the Royale Cookies”. Bring them back. Or at least sell them at the eBar, for goodness’ sake. So that, my friends, was my lunchtime experience at Ruscello. Overall, it was a pretty nice place. It’s not exactly the type of place I’d go to the mall specifically for, though, but it’s nothing against the restaurant itself. It’s just that, in general, I do find it a bit of a hassle to go to the third floor of a big department store for the sole purpose of grabbing a bite to eat. Especially when there are several places that serve similar eats with easier access…and parking. Perimeter Mall is a pretty busy place. However, if you find yourself at Nordstrom picking up a few new stylish things and you get hungry, I would highly recommend that you mosy on up to Ruscello. You won’t regret it! I hope to do a part II department store dining review where I give the NM Cafe inside of the local Neiman Marcus a try! Stay tuned! Prices: Expect to spend between $10 and $20. Perfect for: Lunch Break from work or a day of shopping. What They Have: Nothing too unusual. Just semi-upscale versions of the typical soups, salads, sandwiches, pizza, and specialty entrees. Should You Go? : Go check it out if you’re shopping at Perimeter Mall (or your local Nordstrom store) and want something that’s a few steps nicer than the Food Court, not quite the “fancier” fare at the other restaurants there.